Thanks to modern advances in dentistry, tooth replacement options are more effective and less invasive than in the past. With over 20 years of experience in successfully placing implants, Dr. Jahangiri, Clinical Director, SCFD & Portside Dentistry, can provide you with new teeth that look, act and feel like natural teeth. Dr. Jahangiri considers implants to be vital to modern dentistry because they provide nearly the same chewing power of natural teeth and can last a lifetime with proper care. Moreover, dental implants are the only tooth replacement option that helps prevent the bone loss that can occur when teeth are missing. An implant is a titanium post that is placed in the jaw and acts as an artificial tooth root to which a crown, dental bridge or denture is attached. Dr. Jahangiri is highly skilled and experienced in dental implant treatment. 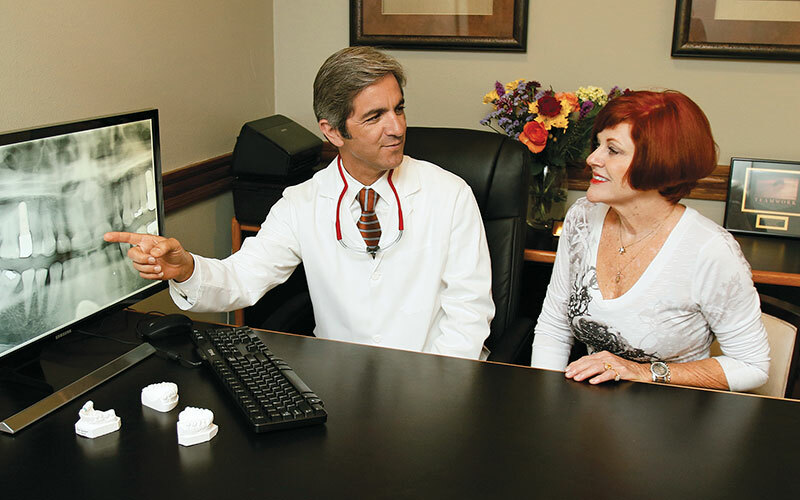 Dr. Jahangiri has the extensive knowledge and skills to provide every phase of your implant treatment—from precise planning to the final restoration. Dr. Jahangiri will gently perform any needed tooth extractions or bone grafting so there is no need to be referred to outside specialists. 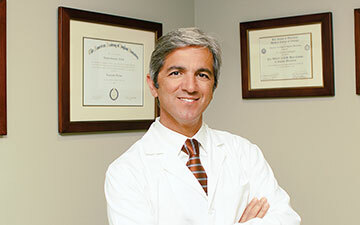 Dr. Jahangiri has over 20 years of experience in placing implants. He is highly knowledgeable and skilled in every aspect of implant dentistry. Dr. Jahangiri has provided thousands of patients with implants and has successfully treated a wide variety of cases. Dr. Jahangiri was awarded an associate fellowship with The American Academy of Implant Dentistry. This prestigious status is awarded to implant dentists who undergo rigorous examination of theory and practical competence. Dr. Jahangiri uses 3D imaging and treatment planning software to meticulously plan out the angle and position of each implant. 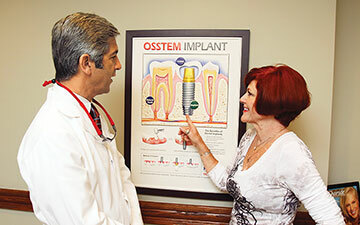 Dr. Jahangiri uses state-of-the-art equipment for precision implant treatment. Our 3D CT scanner provides high-resolution views of your teeth, jaws and surrounding structures. 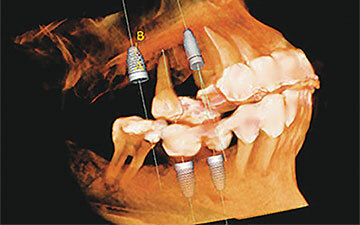 Dr. Jahangiri also uses special 3D software to meticulously plan for implant placement. To accelerate healing and reduce discomfort following your treatment, Dr. Jahangiri uses special growth proteins that are extracted from a small amount of your own blood. Dr. Jahangiri provides IV conscious sedation for patients who need help relaxing during treatment. IV conscious sedation puts you in a light, sleep-like state during which you are still conscious and able to respond to requests. To replace a single missing tooth, Dr. Jahangiri recommends placing a dental implant topped with an aesthetic porcelain crown. Dr. Jahangiri will replace several missing teeth with either individual implants or an implant-supported bridge. Implants can restore chewing power and return a beautiful smile. 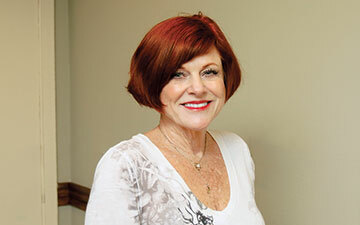 Dr. Jahangiri can provide you with a snap-in denture to replace an entire arch of teeth. Snap-in dentures are held in place by dental implants. Compared to traditional dentures, snap-in dentures are more stable and provide better chewing power. 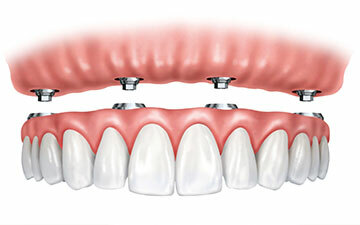 Snap-in dentures are minimally invasive and are the most economical form of implant treatment. Dr. Jahangiri recommends fixed-in new teeth supported by more dental implants to provide the greatest stability and most lifelike function. Fixed-in new teeth will give you nearly the same chewing power as that of natural teeth, and they can dramatically improve your quality of life. In just one office visit, Dr. Jahangiri can provide you with any needed tooth extractions, implant placement and aesthetic temporary teeth. •	Implants are the strongest and longest-lasting form of tooth replacement. •	Implants look, feel and function like natural teeth. Most people do not notice any difference between their implants and their natural teeth. •	Implants, unlike dental bridges, do not require any alteration to the structure of the adjacent teeth. •	Implants prevent bone loss by providing healthy stimulation of the jaw. This helps prevents the undesirable consequences of facial sagging or wrinkled skin, which can occur with missing teeth and dentures. “My left front tooth was really loose. “Dr. J tried to save it but the bone loss was too extensive. He was so careful in explaining the procedure to make sure I understood how it would go.